The 4th LAR Marines are conducting a road march from the port of Klaipeda, Lithuania to the training area in Adazai, Latvia and conducting static display events in a few local communities along the way. The focus of the ceremony was the integration of multinational forces and the enhancement of the relationships between the U.S. Marines and their Latvian military counterparts. Ambassador Nancy Bikoff Pettit briefly addressed the troops and the people of Bauska before the ceremony, recognizing the valuable partnership between the U.S. and Latvia and thanking the local community for their hospitality. 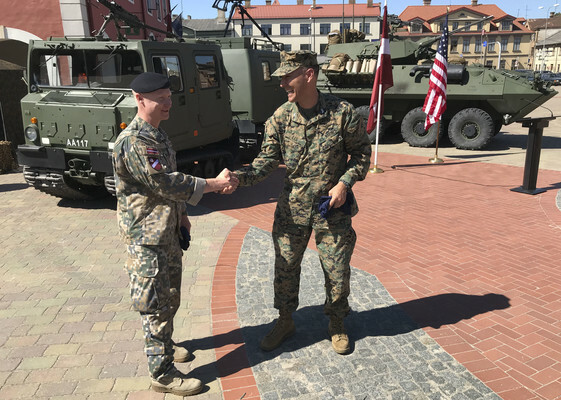 The ceremony gave the citizens of Bauska the opportunity to observe the different militaries involved in the annual Saber Strike exercise through a static display of military vehicles and interaction with the U.S. Marines and Latvian guardsmen. The 4th LAR convoy will end its journey at the training area in Adazai, Latvia to begin the first stages of Saber Strike, June 3, 2018. Saber Strike 18 is a U.S. joint and multinational exercise conducted at various locations throughout the Baltic States and Poland. The annual exercise prepares Allies to respond to regional crises and enhance the NATO alliance throughout the region.